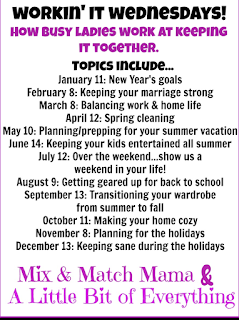 We're working it Wednesday today with Erika & Shay for their monthly link-up! 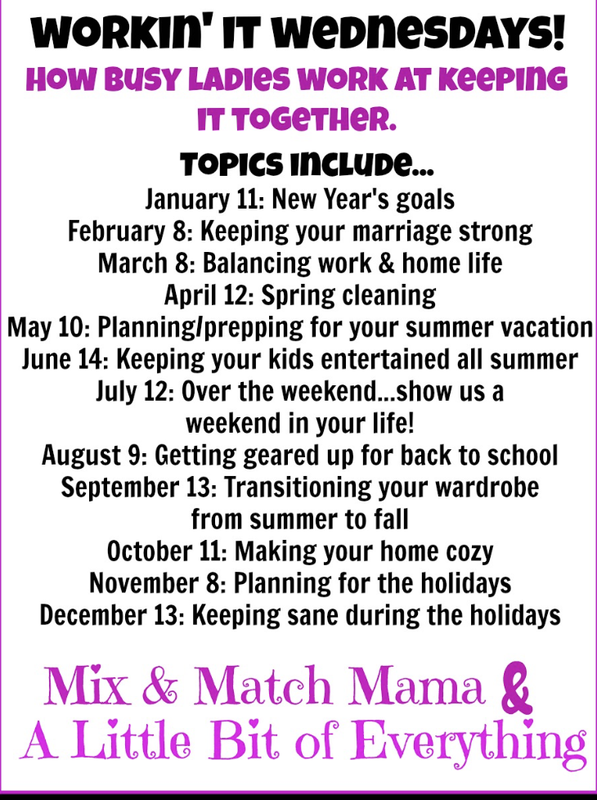 We shared our resolutions HERE last month, and this month we are discussing how we keep our marriage going! Y'all...let me start with we failed big time at this, but because we failed so royally, we also were giving the chance to work hard at it. I am no marriage expert of any kind, and I will never, ever act as though I have it figured out. We met at a small, country church in Fall Branch, TN. I was home from school for the summer, and he was the new pastor @ my grandparents' church. My sweet Poppy said that the new preacher needed a friend, & we just clicked. It was an easy friendship that turned to love, and almost a year later we were engaged. Then about 8 months later we were married. We found out we were expecting Stephen just after our first anniversary, and then we were called to a church in Gastonia, NC when Stephen was 9 months old. Shortly after moving to Gastonia we were expecting Carson. A lot happened in such a short period of time. We left family and friends and formed friendships and relationships with people in a whole new area. Life was good, and then after an early miscarriage, we found out we were expecting our Nataleigh. Having kids makes having friends a funny new thing. You tend to flock to people who have kids like you, and that's what happened. We began to focus mostly on establishing those relationships, and cracks formed in our own marriage. Cracks neither of us saw coming. Those cracks are critical, and they eventually broke us. Yet, I openly praise Jesus for that friendship that was so easy in the beginning because I swear it was the reason that after almost 2 years that we are here. Our friendship never changed, but we allowed Satan to distract each other from the love that was always there. Today our marriage is very healthy & thriving, but it's still not perfect...& that is perfectly fine for me. We treat each other differently than we did before. We have a different level of respect for one another. We are very intentional about our communications throughout the day. Our lives are super chaotic, & I don't foresee it slowing down any in the near future. So ya just adapt, right?! We are both very naturally sarcastic, and we are so much alike. These reasons are why that friendship naturally formed. He's for sure, 100% my best friend, and honestly, he's the best, best friend ever! The toughest part of getting our marriage back on track was the trust aspect. It took years & life events to build our trust up to where it was, and unfortunately it took one infidelity to shatter every bit of that trust. One lie made me question every single word, and if I'm going to be honest, it's what I struggle most with now. Joe is completely transparent with me, yet it will always be in the back of my mind a question. I have strategies, like praying, talking with confidents, journaling, and such that help those thoughts not control my behaviors. I'm finally getting a grip on those insecurities. He reassures me daily that he loves me, and that this marriage is the most important earthly relationship that he has. I don't have doubts because of anything that Joe does today, but because of what we survived. I want to delve so much more into marriage and why our Christian-based marriage is so important, especially now that we are parenting 3 beautiful babies. I just feel like this post is already so long, and I could go on for days. While we were separated, I spent so much time in studies, commentaries, and the Bible learning about Christian marriages and the covenant we make with each other as well as with God. A little bit of consistency, respect, friendship, and love mixed together and bathed in prayer make for the best marriages, and this is what Joe and I are working at! I'm hoping to post my foodie post tomorrow from the Super Bowl, so fingers crossed that I wake up in the morning feeling better! What a brave and strong post! Love the advice of the end. wishing you both well in your marriage! this is a great post and love that you have so much love and trust in one another! Hope you'll stop by mine as well and let me know what you think! This was a fantastic post!! I am SO proud of where you guys are now. It's so hard to get that trust back and move on. 2 of our very best friends are now going through a divorce because they couldn't trust anymore. It's so sad to watch. It's definitely hard work, but it's so worth it. Praying big prayers for your friends and you all as you all go through this together. Before coming across the advice on http://Prophetakeem.webs.com/ my marriage was in serious danger of heading towards divorce. Now we are in a better place than we ever were before! I feel very lucky and blessed that we were able to turn our marriage around like this. My husband used to spend as much time as he could away from home. Now we are so in love and its funny now he had to go away for the week we have been talking on the phone every day. We can't wait to see each other again! If you want to stop your divorce, you totally can!! Don't give up on love!